Double boarded, I'm looking at $495 a year for this MOC BS with "assessment fees" and "program fees" for IM and SS. No thanks. MOC is BS science and needs to end immediately! The AMA House of Delegates has spoken and it is high time you start listening and stop projecting. Get your head out of the sand and listen. Respect the vote. My delegate spoke for me and everyone else to end MOC immediately. So end it. You can't just double down and hike the price. That is surreal. This does not sit well. The ABIM has lost me. I expect MOC to end immediately. There is no other choice. Certainly there is a spark of understanding/awareness left somewhere in Mt. Airy or 510 Walnut Street. If find all this surreal too. Just when you think things couldn't get any worse as the ABIM moves to make its ridiculously complex, costly, time consuming, and heinous business model touting it is being "more flexible" by offering onerous two-year testing, which is not flexible at all. Nothing has been revealed about the unvetted thugs with all those conflicts of interest in the testing industry who want to spy on us and keep data on our offices and homes and how we live. Then wham the Grand Duchy of the ABIM wants to extract more money to pay for its infamous executive overhead. Principally for the Rich Baron and his PcW team. This educational Ponzi scheme called MOC is supported by physicians to be of the industry and for the industry. That really hurts. Look at how much of that increase involves millions in malicious legal fees for a time-barred politically motivated witch hunt in Puerto Rico. The counter suit in San Juan will cost the ABIM millions more. It is all clear now what ABIM stands for and who they are, especially after the evidence is in and weighed. The ABIM serves not physicians in self-regulation. It just serves itself in milking us and uses the money to control us. It is easy to see why now. Why have I and others been paying? I have had no "choice". This is indecent, immoral and illegal. MOC must be stopped now. I"m getting tired from all the confusion at the ABIM. Who can follow anything they"re doing? What are they transforming into again? The MOC Broadcasting Corporation? A classic 24-hour fake news media conglomerate spreading corporate propaganda. I have not learned one useful thing from them except to try to stay away from one-sided abusive relationships. Too much change too soon seems like desperation. That is not a healthy way to carry on with a relationship and expect there to be trust. Physicians are a community seeking comraderie and solutions to daily problems, not an authoritarian organization leading us down a one-way dead end street called MOC. I (we) can keep up quite well in professional life and our educational needs, It is just nearly impossible to keep up with the people at the ABIM. Too many changes to follow. Way too many changes in their confliced administration as well. And we are told little of substance about these people. Or why they really hired them. Like Cassel they are neither clinical physician or scientist, but rather revolving door corporate politician in bed with the industry and government to the extent it furthers their corporate and political objectives. Medicine is not prostitution. I do not know the people at ABIM and have little respect for their ethics and values. I see them as nothing more than tax dodgers and corporate prostitutes aiding and abetting the elites who also collect from us and pay almost no tax. The best thing for the few healers/doctors left at the ABMS is to resign immediately and save themselves. It's important to spend time with family especially if they have been ill.
Get training to go back into medicine serving the sick and dying. Stop being bean counters of quality and cost. Someone else can do it. Stop confounding the world with fake statistics that mislead to further some cause. Just be a human being simple and direct again. There is a profound physician shortage that the whole of the quality assurance industry has helped create. I find what the whole of this industry is doing to be so strange. They are so lost it appears they have no clue how to run a certification or watchdog company. What does it all mean except money and consolidation of power? That's meaningless. With their hard to understand fees on top of fees and policies as liquid as quicksilver it repels one away. 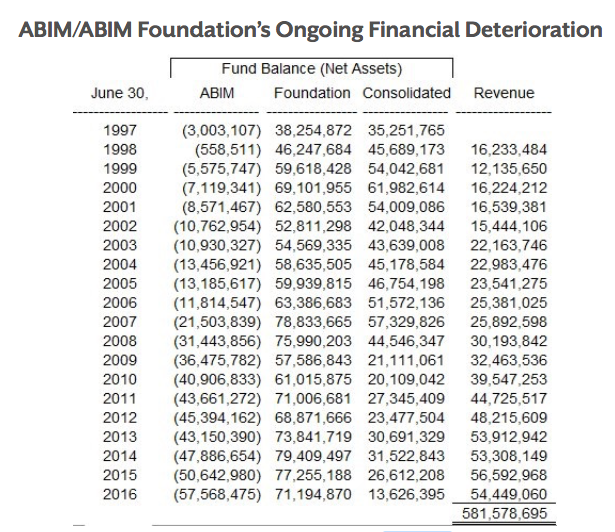 Btw the ABIM is not going anywhere, except on its way to losing even more money. It is certainly not a hard-working physician"s job to prop up the ABIM or any of the 24 medical specialty boards. The best thing to do with the 24 boards and umbrella is to shut them down and donate the ill-begotten cash to real science. MOC is a sham and a scam. It is time to stop pretending to be the good shepherd and go do something useful that may not make as much money, but you and everyone will feel better hopefully at the end of the day. And one might start to feel renewed and free again. Amusing that they now list themselves as "Guidestar Platinum" which looks like some sort of self-reported rating that they can use to tout how wonderful they are. Sounds to me like the ABIM is instituting its own desperate form of MOC: Maintenance Of Cash. They got their last dime from me. Let 'em burn! If physicians act together they can win the fight against MOC with all the debilitating control it leverages over practicing clinical and academic physicians. It is worth noting, MOC does not affect non-clinical physicians who work as managers and directors for companies like PriceWaterHouse who only profit from MOC, at the expense of physicians. Such companies profit by giving advice and tax schemes to insurers, hospitals, data collection companies/societies, and quality assurance organizations, and so on. As it is clear what the ABMS really is and who they work for (the industry and not docs), I have little sympathy for them. My input is in the form of a proverb which illustrates the best way to help them and help oneself at the same time. No need risking your own finances and bailing out their greedy and reckless behavior. No need to get too close and risk falling into their financial hole too. As was said above by an astute person, these are not the kind of abusive people that you want to let get a hold of you by getting too close too. Do not sign any take it or leave it contract/pledges with them. It is dangerous. "Better to spit on or mock the man stuck in the muddy ditch crying for help by the side of the road. Above all stay as far away form them as you can. 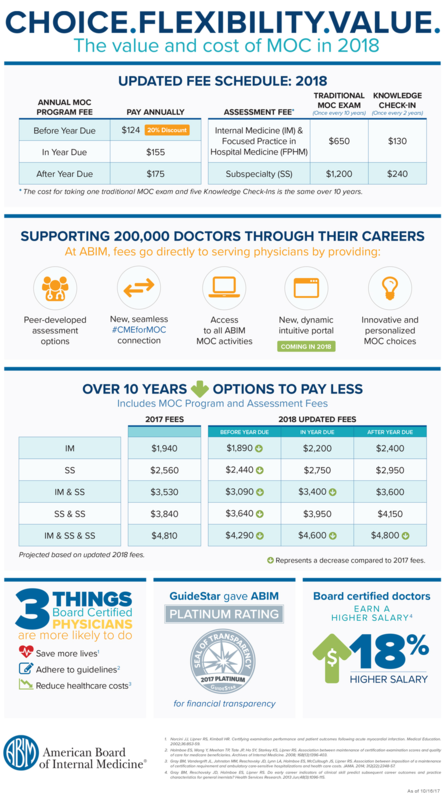 If you know what is right by studying the facts, just say no to MOC and do not pay them. Work hard to change the laws in your state to protect yourself from such people who just use another and serve as proxies for industry that they say they receive no money from. They don't get any money form industry, because the industry colludes with the quality assurance cartel and creates mandates so that physicians are forced to give the money in behalf of the industry. Or else docs will find themselves helplessly unemployed and unemployable. Is that a kind organization? Certainly not. What a scam MOC is. It is beyond any Ponzi scheme as it affects money and health of the nation. Talking with the ABMS executives is like the story of emperor's new clothes. They are naked in all of their corruption and deep collusion with the industry. Is our justice department blind to what is perhaps the greatest heist in the history of the world. And what part the ABMS has played in the change in hands of billions and even trillions of dollars in the healthcare industry. When you see how all the corrupt pieces and how they fit together, one wonders if this is really America?